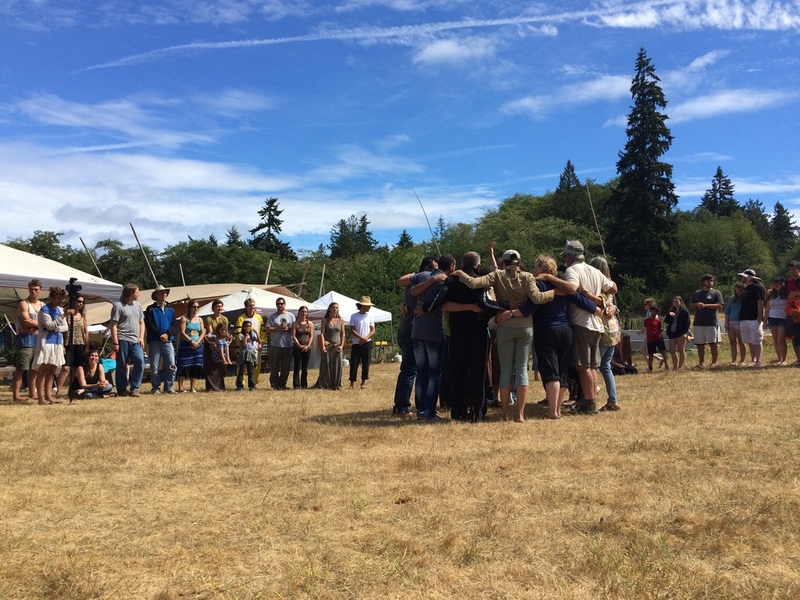 My fiancé Bonnie and I had the privilege to be on core team and lead the teen realm at a Nonviolent Communication family camp on Vashon Island, WA. What a wonderful week 80 participants that came to camp looking for connection, support, new friends, and communication skills. We spent most of our week with the teens and their families, the group this year really engaged in learning new skills and having edgy conversations. One meaningful experience for me was that we had a group of 8 men and women and teens from Palestine and Israel. They came to camp with the intention to learn how to facilitate Nonviolent Communication and run family camps. Their intention is to hold 3 camps 1 for Palestinians, 1 for Israelis, and 1 for both groups to come together! What a beautiful vision, I am so honored to be able to support them in this vision. Part of what I love about camp is the moments of watching a group of 8-11 year olds decorate a golf cart turning it into a “horse”, and then speeding through camp! I am hopeful that Bonnie and I can attend again next year… We are even playing with the idea of starting a camp here in Colorado! Hope to see you there. This past June I had the privilege to support a Rites of Passage ceremony in the Colorado front range. The ceremony involved a cord cutting ceremony with the mothers, processing with the young men’s fathers, an all night solo, and a beautiful welcoming ceremony for the initiated young men. Having a rites of passage or initiation to manhood is a powerful and important step in a young man’s journey. I highly recommend that your family consider a rite of passage that involves the whole family. This allows for your family to grow and learn together, strengthen bonds and create lasting memories. This particular ceremony was organized through the Men’s Leadership Alliance in Boulder, Colorado. They have a variety of workshops that support men to heal and grow. 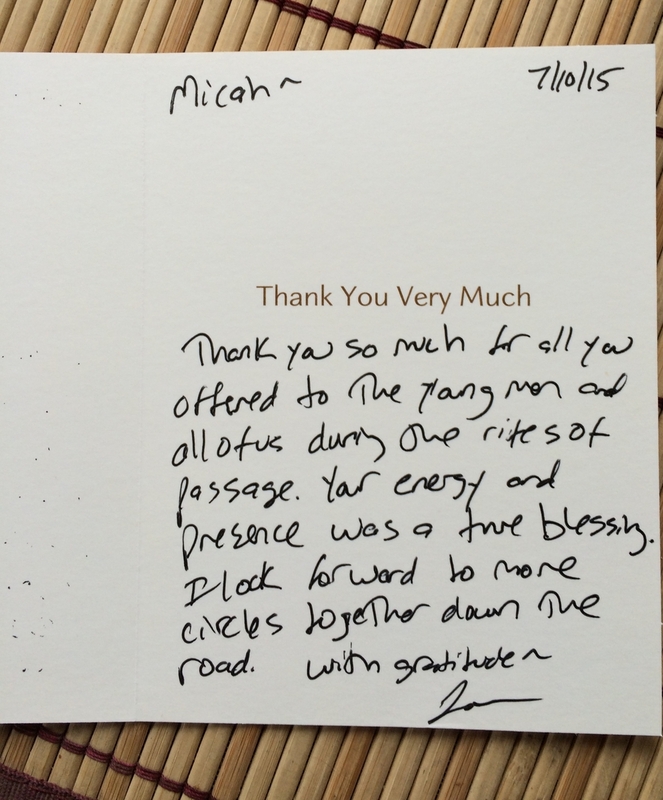 I recently received this thank you card and wanted to share it with you all as it was such a sweet letter to receive.